The current season of the Big Brother Naija reality show is fulfilling its promise of ‘Double Wahala’ drama despite many Nigerians not finding it entertaining. Tobi has come under fire from many Nigerians who believe he is being played by his ‘love interest’ Cee-C, and many celebrities have reacted to his weakness and attitude towards her. 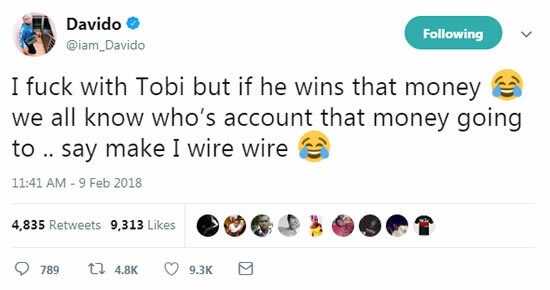 Superstar Singer Davido has just revealed that he likes the show’s contestant and current head of house Tobi. However, he said if Tobi wins the N45m prize, he will give it all to his love interest, Cee-C. I think it was quite obvious whom he was referring to, LOL. 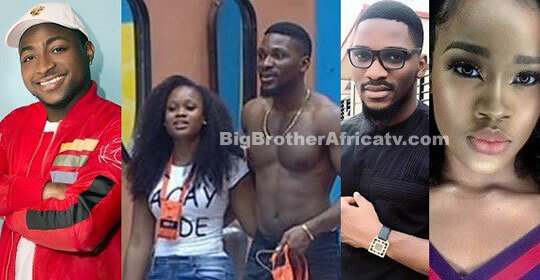 However, Tobi has had an unending obsession over his fellow housemate and has tried to kiss her for quite a number of times, but has been repeatedly turned down (Curved) by Cee- c to the amusement of other housemates and the viewers of the reality TV show.